Independent auction network ServNet revealed Tuesday a new member on its board of directors. Tapped for the position is the owner and general manager of Pittsburgh Independent Auto Auction: Dave Angelicchio. He has been elected to serve a two-year term on the board that is headed by chairman Jeff Brasher (Brasher's Reno Auto Auction); president Charles Nichols (BSC America); vice president Patty Stanley (Carolina and Indiana Auto Auctions) and treasurer Kevin Brown (Missouri Auto Auction). Also serving as directors are Doug Doll (Kansas City Independent Auto Auction) and Brad Sturgeon (DAA of the Rockies, DAA of the Southwest). Commenting on the news, Nichols said, "I am very pleased to announce Dave Angelicchio's election to ServNet's board, and to work alongside someone of his expertise and dedication to the industry. "It is an honor for me to work with Dave and the other members of ServNet's board who exhibit such strong leadership and devote so much time and energy to serving this organization,” he added. Highlighting the new board member’s career in the industry, the organization noted that Angelicchio is a past president of the National Auto Auction Association. He is also currently a member of the NAAA Executive Committee, and serves as treasurer of both the NAAA and the NAAA Political Action Committee. "Our auction has derived tremendous benefit from its association with ServNet," said Angelicchio. "Partnering with the owners of the leading independent auctions in the country is an invaluable asset, which assists me in building strong and continuing relationships within the industry. I am very proud to serve on the board of director of this elite group of auctions. "To me ServNet auctions offer the best of both worlds, combining the strength of independent ownership with the benefits of sharing best practices and other synergies that come from being part of a large group." GE has taken a big step in its alternative-fuel vehicle goals. In a collaboration announced Tuesday, GE is buying 2,000 new Ford C-MAX Energi plug-in hybrids for its fleet, which would put GE a fifth of the way toward its alt-fuel target. With the 2,000 C-MAX Energi units coming into the fleet, GE will have 5,000 total alternative-fuel units in its fleet. It is aiming to eventually have 25,000. The cars will begin rolling into GE’s fleet this month. “We are focused on providing our customers and our fleet with more economically and environmentally efficient vehicles. The Ford C-MAX Energi plug-in hybrid is a great addition to our expanding fleet of alternative fuel vehicles,” stated Mark Vachon, GE vice president of ecomagination. Also part of the deal, the automaker will help promote GE’s lineup of alternative fuel infrastructure solutions. Specifically, Ford said it will market the following GE products to its commercial customers: WattStation charging station and CNG in a Box natural gas fueling station. Additionally, Ford will offer alternative fuel vehicles for test driving at GE’s Vehicle Innovation Center. “Ford is launching six new electrified vehicles – a big bet that fuel prices will continue rising and lead to more demand for advanced fuel-efficient vehicles,” says Ken Czubay, Ford vice president, U.S. marketing, sales and service. “We are pleased to partner with GE, a company that is charting a similar course, to promote advanced technology and energy savings,” he added. Also, Ford and GE are teaming up with Georgia Tech researchers in examining GE’s fleet to help electric driving and charging become more efficient. They will look at GE employee driving and charging behaviors, while also employing the MyFord Mobile app. Research will be shared with commercial customers. Naked Lime Marketing has announced that its digital reputation management service for dealers has been approved by General Motors for the 2013 Standards for Excellence program. Moreover, dealers using its marketing services may be eligible for reimbursement for these services under the GM iMR (In-Market Retail) Turnkey Program in which GM reimburses dealerships for a portion of eligible local advertising and marketing costs incurred from approved vendors, officials shared. The company also shared that it offers options for dealers working to manage a store’s online presence. “The Response Handling Service enables dealers to more effectively monitor the entire web, encourage positive reviews, and manage negative reviews. The Social Marketing Management Service helps put the dealer's brand where consumers are looking on the top social and local sites,” the company said. To enroll in any of the GM-approved reputation management services from Naked Lime, visit http://repman.nakedlime.com. 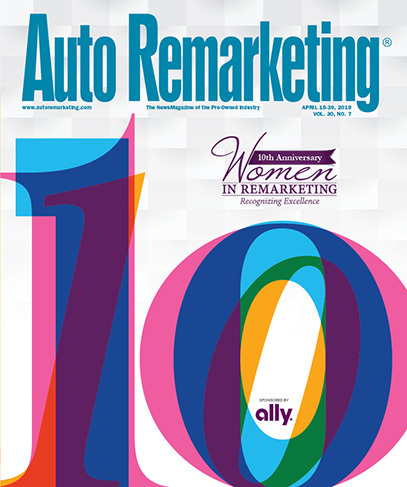 For more tips and tools for advertising and reputation management, see the Dec. 1–15 issue of Auto Remarketing and look for the special “Advertising Ideas for Dealers” section. A behind-the-scenes look at one of the nation’s largest auto auctions and its processes was the latest course of study for students of the Auction Academy. The Academy’s inaugural class, dubbed the Next Generation/Sons and Daughters, took part in a two-day curriculum offering insights into the detailed preparations and processes used by Southern Auto Auction. The gathering marked the class’ third training session, and was held Oct. 22–23 at Southern Auto Auction in East Windsor, Conn.
Auction owner Larry Tribble and vice president Garrison Hudkins worked with Auction Academy chief operating officer Randall McCathren in developing the curriculum. “This third class session provided an outstanding experience for Auction Academy’s Next Generation class, building on the excellent information and experience they received in the first two sessions,” said McCathren, noting the first session was held in Franklin, Tenn., and the second in Spokane, Wash., in conjunction with DAA Northwest’s Rock & Roll Sale. “Within the environment of the largest and busiest independent auction in the U.S., the training topics included extensive review of both ‘buying’ and ‘selling’ as a dealer; metrics for measuring performance; identification of key geographic market areas; risk management; succession planning, as recounted by a second generation owner; vehicle appraisals; auction block technology, and a close-up view of the Eastern Power Sports Auction,” McCathren said. Guest speaker Paul Assaiante, the coach of Trinity College men’s squash team spoke to Auction Academy students on his career in college athletics, drawing parallels to the group’s personal and business experiences. The Trinity team holds the longest winning record in collegiate sports. In thanking the Southern Auto Auction team for taking part in Auction Academy, Pons noted that the auction runs more than 4,000 vehicles each week across 20 auction lanes. “We thoroughly enjoyed hosting this session of Auction Academy,” said Tribble, who is a past president of NAAA. “As a second generation owner of a family business myself, I am happy to see the next generation embracing our industry with such enthusiasm and dedication. Auction Academy’s Next Generation Owner course is a two-year training and development program for the sons and daughters of today’s independent auction owners. The course includes 16 students representing 13 independent auctions and one vendor company, who meet for quarterly classes and periodic field trips to auction facilities around the country. Structured like an executive MBA program, Auction Academy offers tracks for the next generation of auction leaders and for current auction leadership that are designed to enhance essential skill sets, promote best practices, and yield better auction performance, the company said. The second class group of Auction Academy has now been fielded, consisting of auction management personnel who will begin their two-year curriculum on Nov. 29 in Franklin, Tenn.
For more information about Auction Academy, visit www.auctionacademy.net. A deal long in the making has come to a close. Hertz Global Holdings announced this morning that it has successfully completed its previously announced acquisition of Dollar Thrifty Automotive Group. As a result of the transaction, Dollar Thrifty has become a wholly owned subsidiary of Hertz. Commenting on the news, Hertz chairman and chief executive officer, Mark Frissora said: “In the 94-year history of Hertz, our employees and business partners have never been this excited. Over the past six years, we have competed successfully with only one global premium brand in place while our competitors have had multiple brands to work against us. “Starting today, we now have two additional, popular brands to compete across multiple market segments, with plans to offer them to our many partners and customers. That's why we are pleased to announce that the transaction is complete, and we look forward to working expeditiously with Dollar Thrifty to integrate the strengths of our two great companies,” he continued. Hertz completed a tender offer in which it purchased approximately 99.6 percent of the shares of Dollar Thrifty common stock then outstanding at $87.50 per share in cash. “Hertz subsequently acquired the remaining shares of Dollar Thrifty common stock by means of a short-form merger in which such shares were converted into the right to receive the same $87.50 per share in cash that will be paid in the tender offer,” officials shared. And in order to accomplish the short-form merger, Hertz exercised its option to purchase additional shares of Dollar Thrifty common stock directly from Dollar Thrifty. Dollar Thrifty's common stock will no longer be listed on the New York Stock Exchange. And as part of the agreement decided with the FTC, Hertz will be selling a few of its own assets, as well. Franchise Services of North American provided an announcement on transaction timing relating to its agreement to acquire Simply Wheelz, LLC, a Delaware limited liability company and the owner of the Advantage Rent-A-Car brand, and certain other divested assets from Hertz. Offering some background information, Franchise Services announced that upon completion of the impending deal with Hertz, the company would operate Advantage from 62 rental locations servicing airports across the United States. “As a result of the FTC consent order, Hertz will be required to provide the Company (Franchise Services), or another FTC-approved buyer, with the right to operate on-airport concessions at an additional 13 airports,” officials shared. “As a result, the company may acquire up to 72 rental locations in new markets in the United States,” officials added. Besides the impending acquisition, Franchise Services will take part in a previously announced merger between wholly owned subsidiaries of the company and Macquarie Capital. “Macquarie Capital, through a wholly-owned subsidiary, has entered into a purchase agreement with Hertz for the acquisition of the assets. Closing of the acquisition of Advantage by a subsidiary of Macquarie Capital is now scheduled to take place on Dec. 12, with the closings of the remaining Assets to occur in 2013,” the companies explained. In keeping with its goal of serving all professionals within the collateral recovery industry, Recovery Industry Services Co. formally introduced the Buy-Here, Pay-Here Collateral Recovery Certification Program. RISC said this comprehensive certification program has been endorsed by the National Alliance of Buy-Here, Pay-Here Dealers and is designed for BHPH stores that service their own in-house repossessions. Officials highlighted the program covers all aspects of the self-help repossession process, including applicable federal and state laws. As an advocate for those involved with the self-help repossession process, RISC wishes to see that only certified, insured recovery agents handle recoveries. For BHPH dealers and those stores considering handling their own in-house repossessions, RISC insisted the BHPH Collateral Recovery Certification Program will be vital in ensuring they make the right decisions to mitigate the inherent risks. “That is paramount to ensure the safety of the employee and general public and will only happen through proper training,” Ferarolis said. For more information, dealers can send a message to RISC at services@RiscUS.com, call (866) 996-7472 or visit the company’s website at www.RiscUS.com.